X-rays are invaluable in the evaluation of gunshot wounds. They should be taken in all gunshot wound cases, especially those in which there appears to be an exit wound. 1. To see whether the bullet or any part of it is still in the body. 2. To locate the bullet. 3. To locate for retrieval small fragments deposited in the body by a bullet that has exited. 4. To identify the type of ammunition or weapon used prior to autopsy or to make such an identification if it cannot be made at autopsy. 5. To document the path of the bullet. Using x-rays to locate a bullet will save valuable time at autopsy whether one is dealing with a routine or a special situation. In instances of bullet emboli, x-rays are invaluable in locating the bullet. Hours of tedious dissection can be saved. X-rays are also helpful in instances where a bullet track abruptly ends in muscle and no missile is present at the end of the track. Theoretically, one should have a hemorrhagic track from the entrance to the site where the bullet finally lodges. However, in some instances — especially with small-caliber bullets such as the .22 rimfire — the last 3 to 4 in. of the track, if it is in skeletal muscle, may be free from hemorrhage and virtually unidentifiable because the bullet has slipped in between and along fascial planes. Such an occurrence is seen most commonly in the arm and thigh. X-rays should be performed in all cases where a bullet exits, because an "exit wound" does not necessarily indicate that the bullet did indeed exit. Occasionally an exiting bullet will have enough energy to create a defect in the skin but will rebound back into the body. This may be due either to the elastic nature of the skin or to resistance from overlying clothing. The "exit"
Figure 11.1 Copper jacket retained in jaw. Lead core exited. can also be due to a fragment of bone being propelled through the skin ahead of the missile, with the bullet itself remaining in the body. A special situation can arise with partial metal-jacketed bullets. Here separation of the jacket and the core can occur as the missile moves through the body. The lead core may exit while the jacket remains (Figure 11.1). The core is of no use for purposes of bullet comparison. Only the jacket possesses individual rifling characteristics. At autopsy, if one is unaware that the jacket is present in the body and that it was the core that exited rather than the whole bullet, the jacket can readily be missed. This is especially true if the jacket lodges in the muscle adjacent to the exit. To compound the problem, the core may be recovered at the scene by the police and then be mistaken for the complete bullet. The medical examiner may be informed that the "bullet" was recovered. Facilitating the misidentification of a lead core as a bullet is the fact that the core may have very faint "rifling" marks impressed on it through the jacket. These marks, however, are class characteristics, not individual characteristics; thus, ballistic comparison is not possible. An artifact seen on the lead core of Remington .38 and .357 partial metal-jacketed bullets of older manufacture can be mistaken for rifling marks. As these bullets were assembled, they underwent a mechanical process by which the lead core was inserted into the jacket, resulting in six land- and groove-like marks being impressed on the core. These marks differ from lands and grooves in that they are vertical rather than canted as one would expect in rifling marks. Although in most instances the lead core exits and the jacket remains, sometimes the opposite situation occurs, with the jacket exiting the body. Sometimes, the jacket and core will separate in the body, but neither will exit. The forensic pathologist may recover the core with "rifling" on it and assume it to be the complete bullet. They may then inadvertently leave the jacket in the body or discard it with the viscera. Such mistakes can be prevented by an x-ray of the body, which will reveal whether separation of the core and jacket has occurred. With an x-ray, it is very easy to distinguish between the core and jacket by the different densities (Figure 11.2). 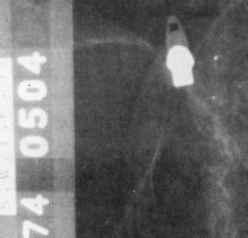 Figure 11.2 .357 Magnum bullet with separation of core and jacket. The less dense copper jacketing appears grey; the denser core, below the jacket, white. The introduction of Silvertip® pistol ammunition by Winchester has complicated the whole process of detecting bullet jackets by x-ray. In some calibers of Silvertip® ammunition, the jacket is aluminum instead of copper alloy. In such cases, if separation of the jacket and lead core occurs in the body, the jacket may not be seen on routine x-rays because it is aluminum (see Figure 10.10). The recovered bullet core will show the impressed marks of the lands and grooves. Ballistic comparison cannot be made, however, as these are only class characteristics. In through-and-through gunshot wounds, small fragments of metal from the missile may be deposited along the wound track or in bone perforated by the bullet. These fragments are readily missed at autopsy, especially if only two or three are present. It may be important, however, to recover such fragments as they can be analyzed by scanning electron microscope-energy dispersive x-ray (SEM-EDX) to determine the trace metals present. If the fragments are large enough, they can be submitted for quantitative compositional analysis by inductively coupled plasma atomic emission spectroscopy. A comparison can then be made with a bullet recovered at the scene and suspected to be the lethal missile. The trace metal content of these fragments may also be compared with bullets in a box of cartridges that is thought to have been the source of the fatal cartridge. Although no one can testify absolutely that a fragment came from a particular bullet or box of ammunition, one can testify that the fragment and the other ammunition are identical in all measurable properties. 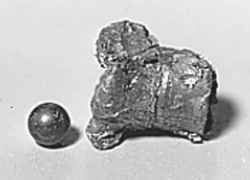 If the combination of trace metals is very rare, one can say that the probability of the bullet coming from another source is extremely small. X-rays may give a pathologist an idea of what type of weapon or ammunition they are dealing with before the autopsy. Thus, the pathologist can recognize partial metal-jacketed pistol bullets, Glazer rounds, pistol shot cartridges etc. (Figure 11.3). X-rays of shotgun wounds may reveal a slug or buckshot rather than birdshot. Complete absence of a missile on total body x-ray (thus excluding embolization) and lack of an exit wound would suggest a blank cartridge. 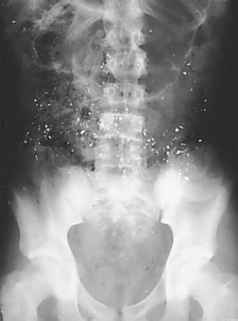 In x-rays of through-and-through gunshot wounds, the presence of small fragments of metal along the wound track virtually rules out full metal-jacketed ammunition, such as may be used in a semi-automatic pistol. The reverse is not true, however; absence of lead on x-ray does not necessarily rule out a lead bullet. In rare instances, involving full metal-jacketed centerfire rifle bullets, a few small, dust-like fragments of lead may be seen on x-ray if the bullet perforates bone. Figure 11.3 Gunshot wound of chest due to .38 Special Glazer round. Note numerous shot and copper jacket. the head (Figure 11.5). This picture may initially be confused with that of a "lead snowstorm" from a rifle bullet. 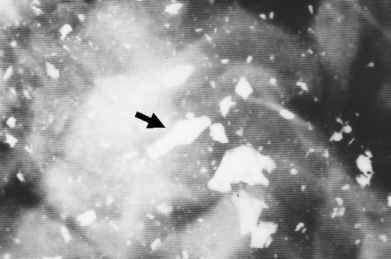 Examination of the x-ray, however, will show that these fragments are larger, coarser and significantly fewer in number than those seen in the "lead snowstorm". Routine x-rays in deaths from gunshot wound may reveal old bullets, pellets, or bullet fragments unrelated to the victim's death. There is usually no problem distinguishing them from new bullets when they are recovered, as the old bullets are encapsulated in fibrous scar tissue. These bullets usually have a black color as a result of oxidation. 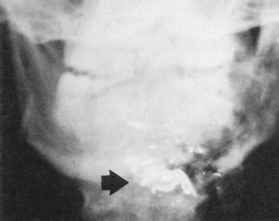 Black discoloration can occur in a new bullet, however, if the bullet is exposed to the contents of the gastrointestinal tract. 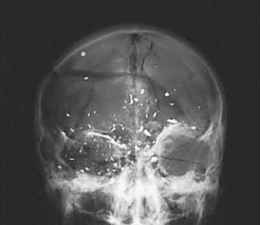 Figure 11.5 Partial fragmentation of lead core of .357 Magnum bullet that penetrated skull. The fragments are larger and fewer in number than those from a centerfire rifle bullet. 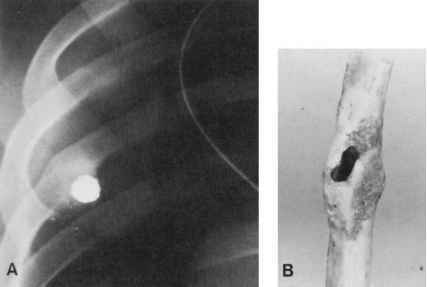 Figure 11.6 (A) Old .22-caliber bullet embedded in rib. Note callus formation on x-ray. (B) Rib with callous. The defect was from where the bullet was recovered. fifth rib, adjacent to the wound track (Figure 11.6A). On recovery of the "pellet," it was found to be a deformed .22 Long Rifle bullet. Re-examination of the x-ray and rib showed a bony callus, indicating that the bullet had been lodged in the bone for a considerable amount of time (Figure 11.6B). In fact, the deceased had been shot almost exactly one year earlier by the same perpetrator. In gunshot wounds of the skull, a large fragment of lead may be deposited between the scalp and the outer table of the skull at the entrance site. This piece of lead is sheared off the bullet as it enters. With lead .32 revolver bullets and less commonly with .38 bullets, this fragment often has a "C" or comma-shaped configuration (Figure 11.7). Rarely, the tip of the jacket of a full metal jacketed bullet is so deposited. X-rays may also show evidence of internal ricochet. This is manifested by a trail of small lead fragments which doubles back on itself. 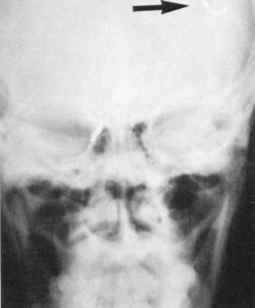 Less information can be learned by x-ray in the case of shotgun wounds. Fiber shotgun wads may on rare occasions be seen on x-ray. These fiber wads appear as faint opaque circles, resulting from lead deposits on the edge of the wad picked up from the barrel as the wad moved down it (Figure 11.8). Figure 11.7 "C"-shaped fragment of lead under the scalp at entrance site. Figure 11.8 Shotgun wad outlined by thin coat of lead. the chest can produce an x-ray picture identical to that in an individual shot at 10 ft. This is due to the "billiard ball" effect.1 Pellets entering the body in a mass strike one another, dispersing at random angles throughout the tissue. 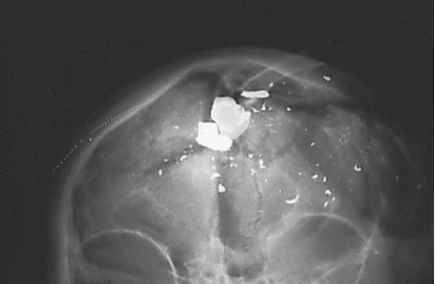 In "explosive" contact shotgun wounds of the head with birdshot, virtually all pellets may exit. This situation has caused confusion when no x-rays were taken of the head and the pathologist was unable to locate any pellets at autopsy. The pathologist then doubted the hypothesis that the individual had died of a shotgun wound. 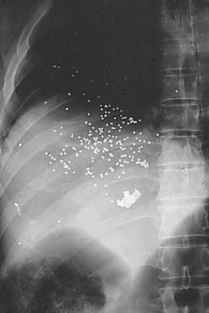 An x-ray in such cases should reveal at least a few pellets. Winchester manufactures a .25-caliber cartridge loaded with a 42.6-gr lead bullet having a hollow-point filled with a #4 steel birdshot pellet.2 On striking bone, the lead bullet tends to deform and is easily mistaken for a .22 Long Rifle bullet. The steel ball usually pops out and can be seen next to the bullet, thus presenting a very characteristic x-ray picture (Figure 11.9). X-rays have some limitations. The exact caliber of a bullet cannot be determined with certainty by use of an x-ray. This is due to magnification of the bullet image depending on its distance from the source of x-ray. Bullets close to the origin of x-rays will appear larger and have fuzzier margins than those close to the film. Approximate caliber estimations can, of course, be made, and certain calibers can be ruled out. X-rays in gunshot wound cases may show artifacts that can be misconstrued as bullets. The "stem" of a zipper often has the appearance of a slightly mushroomed bullet (Figure 11.10). The dislodged crown from a tooth may appear as a flattened bullet (Figure 11.11). 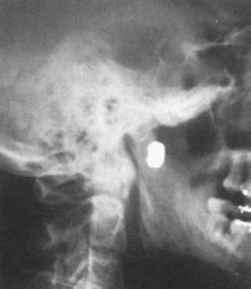 In some cases, bullets carry fragments of an intermediary target into the body and these can be visualized on x-rays. Examples would be links of a necklace or wrist chain, links from a zipper or wire screen. Figure 11.9 Hollow-point .25 ACP bullet recovered from head showing extrusion of steel pellet. ing. In a case seen by the author, the bullet exited the right chest, impacting the inner surface of the front of a suit jacket the deceased was wearing, and then, having lost all its velocity, fell into the inside coat pocket. There was a hole in the bottom of the pocket, however, and the bullet fell through into the lining. This bullet would not have been recovered, if it had not been seen on a routine x-ray of the body. Figure 11.11 Aspirated gold cap of tooth.